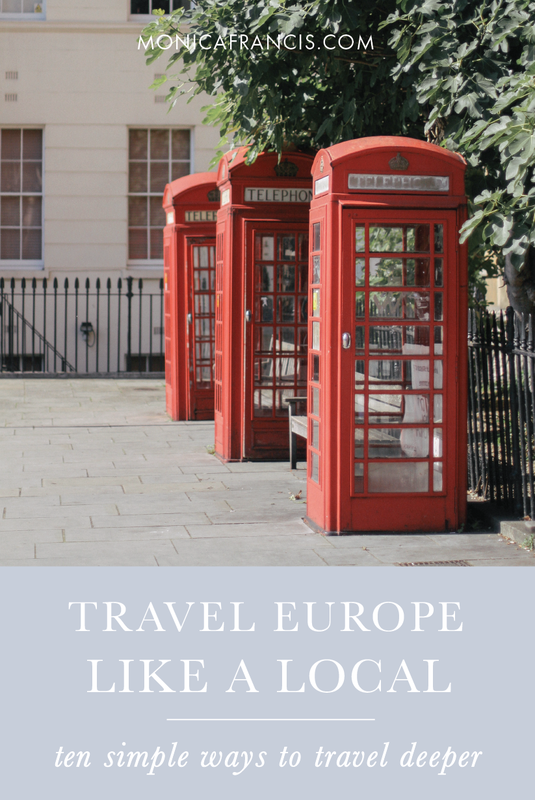 When you're traveling abroad, it can be all too easy to follow a string of guidebook suggestions and never really get to know the place you're visiting. Thankfully, with a few tweaks to your travel planning, you can easily get a taste of everyday life in a foreign country - feeling more connected wherever you are, making unique memories, and spending less along the way. 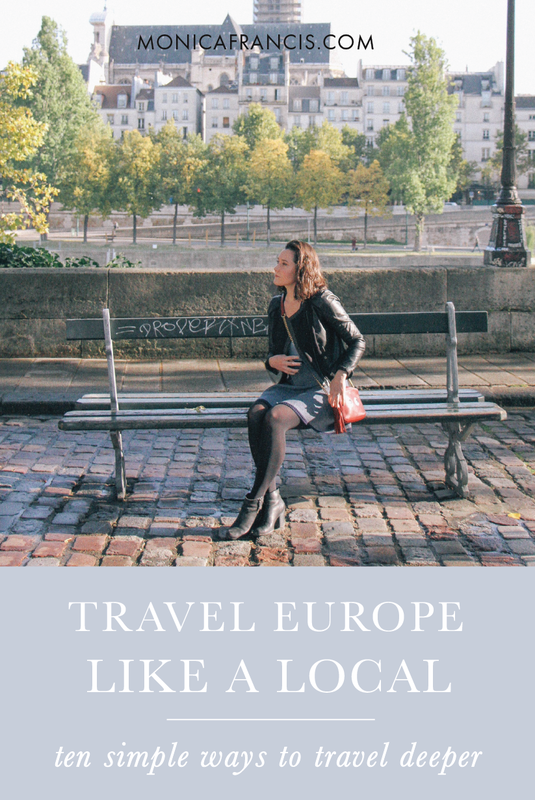 If you'd rather get under a city's skin as opposed to simply scratching the surface, read on for ten ways I've learned to travel Europe like a local. a wonderful cooking class in Paris. A vacation apartment instantly feels more local than even the most charming hotel - and chances are you're staying in the home of an actual resident, so of course you feel more at home. You also generally get more space for the price, and a kitchen where you can at least make your morning coffee. That's a triple win in my book. Whether it's the closest grocery store or a sprawling outdoor market, shopping for a few of your meals will give you a fresh glimpse into local life wherever you are. Personally, I like to plan for one meal 'in' each day, whether it's a quick breakfast, a picnic lunch, or an evening spent cooking pasta and playing music. a sunny Day in London. You might know this already, but I am an ardent fan of walking. 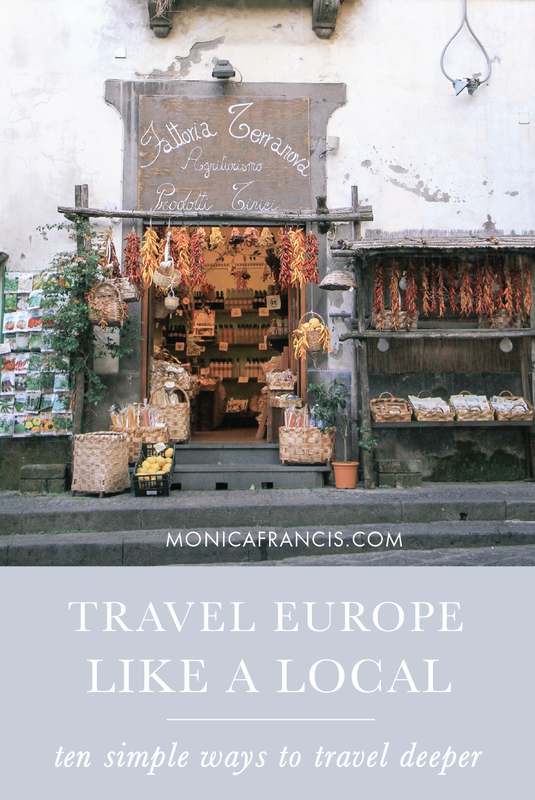 Especially in Europe, so many destinations are highly walkable and it's the perfect way to get to know a new place. Walk whenever you can, and don't forget to wander - let yourself get lost and discover places you haven't already seen on Pinterest - your maps app will still be there for you when you're ready to be found. Even if you only know 'hello' and 'thank you', you'll be lightyears ahead of starting every interaction with 'Do you speak English?' And don't forget that being polite will go a long way anywhere in the world. Take a minute to google the local customs where you're traveling, and make a point to greet people kindly, be patient, say 'please' and 'thank you'. You're welcome. The Honesty Shop in Gimmelwald, Switzerland. Instead of scooting around in taxis or tour buses, try joining the rest of the population on public transportation. Using the metro, the bus line, or the city's rental bicycles will give you a new view of daily life in the place you're visiting. And you'll probably end up with a subway ticket or some spare Euro-change - two of my favorite souvenirs. Venture outside your vacation bubble and make a point to talk with people that cross your path. If you have an Instagram buddy in town or you know someone who knows someone, get together for coffee. You might walk away with a new friend, or at least a couple secret spots that you would never find on TripAdvisor. fritto misto in Cinque Terre. If you like to go for a run every morning or spend lunch breaks people-watching from a cafe, add it into your trip's itinerary. If the language isn't too much of a barrier, take a fitness class or go to a comedy show. When you bring pieces of your everyday life into your traveling life, that surreal am-I-dreaming feeling starts to fade - in the best way. From pastries in Paris to goulash in Budapest, local specialities are always worth a try - even if you aren't exactly sure what they're made of. With many years of history, they're practically guaranteed to be delicious. You just might discover a new favorite, and you can always stick to what you know for the next meal. walking in Paris on the Left Bank. If you're worried about standing out in a bad way when it comes to your clothes, know that it's practically impossible to go wrong with a travel capsule wardrobe of classic pieces in neutral colors. Also know this: Europeans tend to dress a bit nicer than Americans for everyday life, so dressing up just a little can help you blend in - and being well-dressed is a beautiful form of politeness. You're probably reading this article because you dread the feeling of being seen as a tourist, but are you really going to skip out on Notre Dame if you've never seen it? The fact is that you are only visiting, and there's certainly something to seeing the world-famous sights that countless others have visited before you. Don't try to act like it's not a big deal: enjoy your cheesy pictures and the looks from passers-by while you're gazing up at things they hardly notice anymore. Being a tourist isn't bad, but if you want to balance it out - quick! - metro back to the apartment and open that bottle of wine you have in the fridge. Voilà, you're practically native.